At the moment I am dabbling between a few foundations. I'll be honest and say that although I do own a lot of drugstore foundations, of which I use on a regular basis and do the job, for me I just have a love affair with the money munching, pocket busting expensive ones. 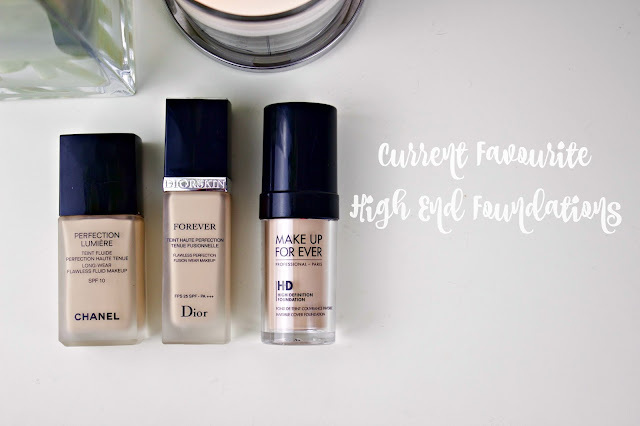 Call me a snob or whatever adjective you like, but I like to look after my skin and I do generally find that the more expensive foundations tend to have better ingredients in them. Not all brands, but a fair few. But on top of that, over the years I have come to find that I actually just much prefer how my skin looks, feels and makes me feel when I have a more luxury foundation on. At the moment, there are three main products that I keep reaching for. 1. Chanel Perfection Lumiere, here. I first bought this product about a year ago, and I have since repurchased. A bit of a risk for me being advertised as a matte foundation, but I had never been disappointed with the other Chanel foundations so I wanted to give this a try. You guys know my love and commitment to Chanel foundations. What I love about this foundation is although it is targeted at mature skin types, it looks just as lovely on all ages. It covers imperfections, evens skin tones, gives your skin radiance without shine, and just makes you look healthy, with a clear complexion. It has great staying power, comes in a beautiful bottle with a pump and will give you a medium coverage. For an added bonus it contains SPF 10. Although this isn't the most recent relaunch of the FOREVER foundation, I wanted to share this one with you as I have only heard from lovers of the previous product how amazing the newer version that has recently been released is. I for one can't wait to get my hands on the new one. This product will give you a very healthy, glowy, a light dewy finish. For me personally I would say it is a medium buildable coverage, great staying power, comes with a pump and has a very slight liquid to powder finish which means it's a great base for makeup! 3. Makeup Forever HD/Ultra HD, here. My most recent discovery and something I have fallen in love with even more every time I wear it. It's my absolute go-to foundation at the moment. If I need coverage I go for this, if I need radiance I go for this, if I need staying power I go for this, if I need a flawless complexion I go for this. Again, it comes with a pump and is a medium buildable coverage. For me it completely covers and flaws and imperfections, any unevenness or redness in my skin tone and is an amazing base for makeup. It comes in an enormous selection of shades too which is a bonus! I cannot rave enough about this product enough. However, like the Dior Forever, this one has recently been revamped too but again I think it is more of an ingredient improvement, and the product is just as amazing if not better. If you are a bride to be, or want to have amazing skin for a photograph or video etc then this is your go to product. It will be your Fairy Godmother! What do you guys think, have you used any of these products before? Watch my most recent YouTube video 'Date Night Makeup Tutorial' here. Watch 'how to achieve a smokey eye on smaller eye shapes' here.